currently non functioning. elements are broken. 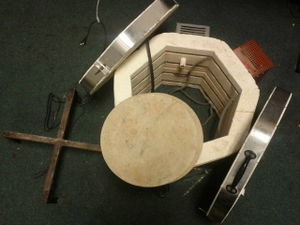 Justa here: having tracked this model down via pictures on Google and then to a dutch supplier, this seems to be a Keramikos oven; built/OEM'ed by a company in Haarlem, Holland , called, you guessed it []. According to references elsewhere, Keramikos will [happily revise broken ovens]; the heat-elements are the things that typically wear out over time. In their webshop they also seem to sell some [wire] that seems to be stuff you'd make/wind a spiral from. These ovens went for more than 1000 euro new; currently are still sold on the second-hand market for around 300 euro.